2014 is the Year of the Horse –but rather than us worshipping the amazing role horses have played in our history or admiring their sporting achievements, tenacity, grace, elegance, dedication to us and appreciating the joy they bring to millions of us 2014 actually brings a welfare crisis for horses in the UK. 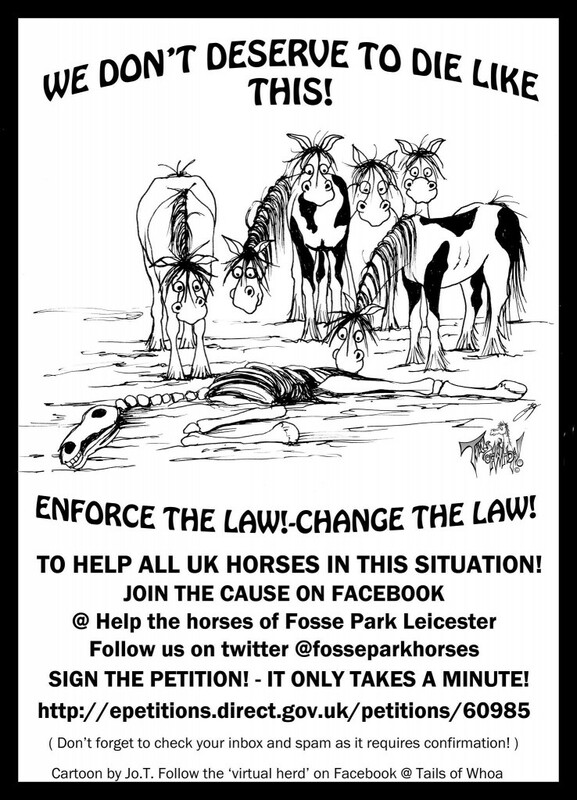 This is why Leicestershire farrier Mark Johnson is rallying supporters to march on Westminster and highlight the need for change by DEFRA on 16th April at 12.00 in Westminster’s Old Palace Yard. Mark and supporters are demanding that DEFRA stop relying on a charity (the RSPCA) to tackle the horse welfare crisis and come up with an enforcement process that works. Can this really be happening in the United Kingdom? 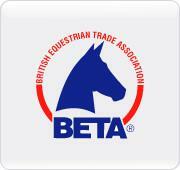 Horse welfare organisations warned of the impending crisis*. The recession, horse-meat scandal and over-breeding combined to drive the value of horses down, and the cost of keeping horses, up. Low value horses are now worth almost nothing. It can be cheaper to let sick and injured horses die rather than call the vet. A horse may be worth less than a bale of hay -so it doesn’t get fed. Corpses are left to rot in fields. The high cost of euthanasia and disposal brings dumping of dead and dying horses in alleys, gateways, fields and gardens. 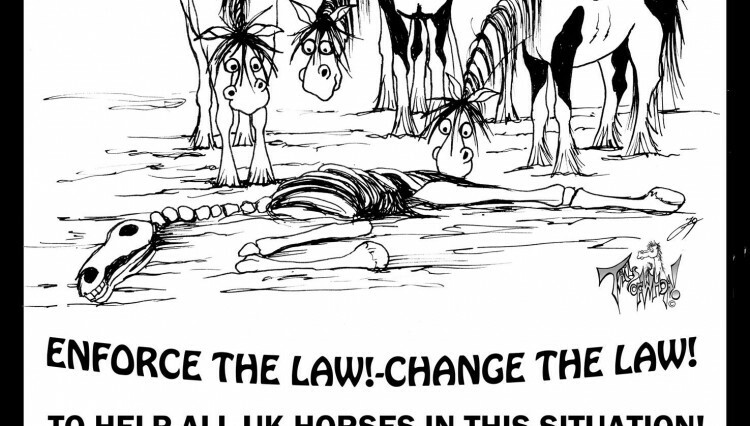 And be warned –if someone dumps a dead horse on YOUR property, you have to deal with it. The crisis became real for Leicestershire farrier Mark Johnson Dip WCF when in February 2014 he discovered a little mare (Hope) dying from neglect, and as her heart stopped beating he promised that she would not die in vain. His Facebook “Fosse Park” campaign gathered 44,000 followers and it took one month of pressure on the RSPCA and other agencies before the herd was moved to safer ground and fed. Then another major story of neglect in Anglesey in March –Mark Johnson photographing horses starved to the point of death while their skeletal companions looked on –all of which were supposedly “monitored” by the RSPCA. 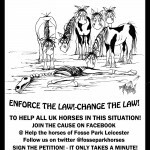 @Help the horses of Fosse Park Leicester. Follow us on twitter @fosseparkhorses. SIGN THE PETITION – IT ONLY TAKES A MINUTE! Dont forget to check your inbox and SPAM folder as it requires confirmation!